Shop for authentic Suriname Flags. We offer indoor and outdoor Suriname flags in durable nylon. Our outdoor flags are finished with a canvas heading, while indoor flags are finished with a lined pole hem and your choice of with or without fringe. We also offer indoor and outdoor Suriname flag sets. 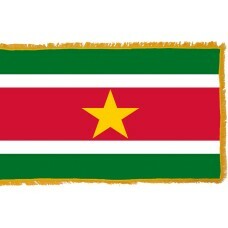 The Suriname flag features five horizontal bands in the colors of green, white, red, white, and green. In the center of the red band is a yellow/gold 5-pointed star. The bands are not equal in size and the green bands have double width and the red band has quadruple width. The red color represents the progress and love of the country, the white color represents peace and justice, and the green color represents the hope and fertility. The yellow/gold color represents the light of the nation and its bright future. The star represents the unity of all the groups. The red and green colors of the Suriname Flag were the color of the political parties during independence. The Suriname flag was adopted on November 25th, 1975, when the country gained independence. Suriname is a country in South America and is the smallest country. It shares borders with French Guiana, Guyana, and Brazil. The capital city and home to half of the country's population is called Paramaribo. The historic inner city of Paramaribo is considered to be one of the most culturally interesting areas in South America due to its many buildings and monuments that date back to the colonial period and for the unique Dutch architecture. The earliest inhabitants of Suriname were called the Surinen Indians, which is where the country’s name is derived from. Approximately 80% of Suriname consists of rainforest. In 1498, Suriname was first sighted by Christopher Columbus and in 1593, Suriname was claimed by Spain. By 1602, Dutch and English explorers began to settle the land and following a feud between them, the British gave the land to the Dutch in 1667 in exchange for New Amsterdam. Suriname became a Dutch colony and was known as Dutch Guiana. During the Dutch rule, the economy was reliant on the sugar plantations and the African slaves. The people of Suriname that managed to escape slavery are referred to as the ‘Maroons’ and they created their own tribal groups in the jungles. Despite the abolishment of slavery in 1863, various tribal groups still exist that are known as, Ndyuka, Saramaka, Paramaka, Kwinti, Aluku, and Matawai. Suriname is the only country in South America that still has Dutch as an official language. Today, the economy in Suriname is heavily reliant on the mining, processing and export of bauxite which is an aluminum ore and it is exported to many major countries. The export of banana, shrimp, and rice is also very important to the economy. Suriname is not a very big tourist destination despite the beautiful sites that it is home to. The two major destinations, that are also listed on the World Heritage Sites are the historic inner city of the capital Paramaribo and the Central Suriname Nature Reserve.